Carefully crafted and cupped by skilled brush makders. Tied with fine brass worie to beautifully hand dipped birch handles, and special plastic protector. Suitable for all delicate, fin and wash work. A professional tool to say the least. Priced to fit everyone's budget. 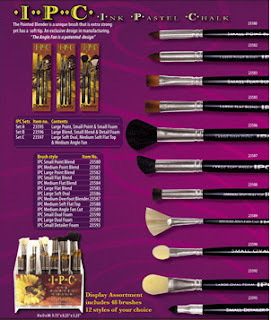 Visit us at http://www.dynasty-brush.com/ and explore an extensive collection of the finest brushes on the market today ! Faux Squirrel's synthetic fibers host as much color as a squirrel brush allowing for an even flow of paint. It will continue to hold its shape and will show for less wear over time. It's innovative soft touch handle allows for a sure grip through hours of painting. Over a year in development FM Brush proudly introduces an exclusive to the Dynasty® line. Try it once and you will agree the simple differences are: it will last longer, cost less and perform to a higher standard. Proven leaders in synthetic sciences, FM Brush Company is leading the way in innovative blends that perform with finer precision and responsiveness than the Siberian Weasel, Squirrel and Sable. 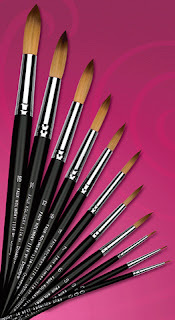 Visit us at http://www.dynasty-brush.com/ and explore an extensive collection of the finest brushes on the market today! The Dynasty Ink-Pastel-Chalk Series by Dynasty® was developed to meet the needs of our ink, pastel and chalk painting artists. Choose from 13 brush styles which include blender brushes, foam brushes, oval brushes, and the exclusive angle fan cut brush. Purchase individual brushes or three convenient sets. Either way you will experience the quality and performance expected from a Dynasty® brush. 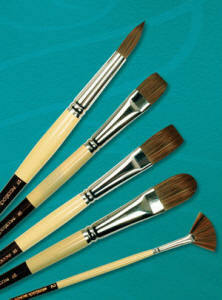 Dynasty Fine Art Sets represent our premium collection of long handle brushes. This excusive set of brushes are a combination of our best selling brushes which are customers globally have come to enjoy. 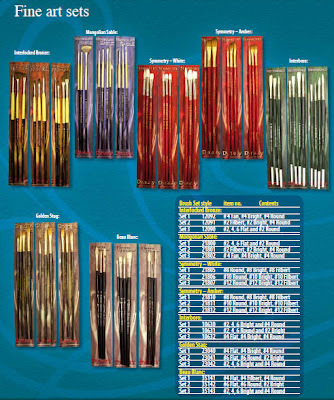 Each brush set was designed to meet the needs of our most discerning oil and acrylic fine artists. Mongolian Sable® Series 3000 - These barbarians can also offer consumers results, with uncommon sensitivity and performance control not found in a brush with this much swagger and bravado. The Mongolian Sable® sets features Brights, Rounds, Angles, Fans & Filberts. This rich and versatile brush collection features dazzling metallic lacquered handles and lush-toned brush hairs that make a powerful statement. Symmetry Series 151 White - Balance - Harmony - Art - This unique design and brush style is hand made for maximum performance and quality. The exclusive design of the handle is shaped to reduce painting fatigue while extending painting time. The large diameter at the handle end serves as the brush counter balance, giving you the ultimate brushstroke experience. Brush styles available include Filbert, Bright and Round. Paint Mediums: Smooth Oil and Acrylics. Symmetry Series 181 Amber - Balance - Harmony - Art - This Symmetry Series brush maintain the same unique design and offers extra strong synthetic hair that is best used with heavy bodied acrylic paint. Brush styles available include Bright, Round and Filbert. 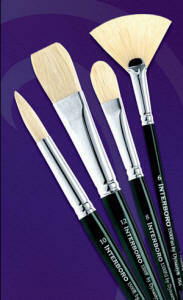 Interboro® Series 1500 - For the Discriminating Artist - The Interboro is excellent for heavy bodied oils and acrylics. Features include long nickel plated seamless ferrule, the finest pure white bristle, interlock construction, and a long natural flag. Brush styles available include Flat, Bright and Round. Golden Stag® Series 1810 - For the Discriminating Artist - The Golden Stag Series is excellent for heavy bodied paint. Features include a long gold plated seamless ferrule, the finest blended synthetic hair with interlock construction and a long natural flag. Brush styles available include Flat, Bright and Round. Beau Blanc Series 70 - Made from the finest Interlocked White Chungking bristle. The Beau Blanc brushes have precision balanced long matte black wood handles. The seamless metal ferrules are triple crimped for lasting performance. 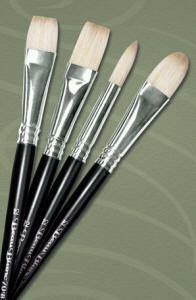 The Beau Blanc long handle brushes are designed for use with oil and acrylic paint. Brush styles available include Flat, Bright, Filbert and Round. The lustrous Mongolian Sable® is here to conquer the world of art without any apologies. This rich and versatile brush collection features dazzling metallic lacquered handles and lush-toned brush hairs that make a powerful statement when you're in their presence. But don't be fooled by their inherent arrogance. These barbarians can also offer consumers results, with uncommon sensitivity and performance control not found in a brush with this much swagger and bravado. The Interlock Bronze® brushes were created to offer consumers a durable, long lasting, collection of synthetic brushes, with delicate control capabilities. This unique alternative to natural hair brushes incorporates our patented interlocking bristle technology, which enables this brush to withstand extensive usage, and harsh chemicals. The performance characteristics of the interlocking bristles provide strong control over thick acrylics and oils, without sacrificing quality. The Interboro® by Dynasty® is excellent for heavy bodied oils and acrylics. Features include long nickel plated seamless ferrule, the finest pure white bristle, interlock construction, and a long natural flag. There are five different brush styles to choose from and over 8 sizes. 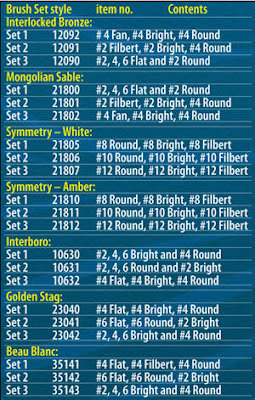 The Interboro® by Dynasty® Display 1500A is available with a generous 126 brushes in each display. The Interboro® by Dynasty® Display 1500B is also available with a generous 60 brushes in each display. Applications: Oil, acrylic, or tempera paints. The Golden Stag® by Dynasty® is excellent for heavy bodied paint. Features include long gold plated seamless ferrule, the finest blended golden synthetic, interlock construction, and a long natural flag. Made from the finest interlocked white chungking bristle. The Beau Blanc brushes have precision balanced long matte black wood handles. The seamless metal ferrules are triple crimped for lasting performance. 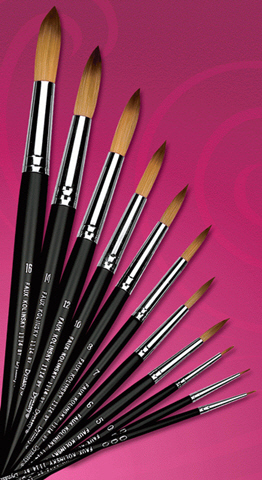 The Beau Blanc long handle brushes are designed for use with oil and acrylic paint. Available in sizes: 2, 4, 6, 8, 10 & 12. Choose from 16 different sets which will allow you to experience a variety of brushes within each brush set. 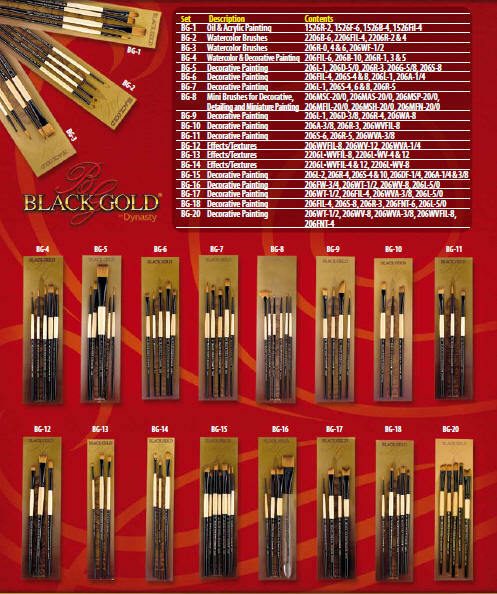 Our hand-crafted Black Gold brushes are as distinctive looking as they are unique in their professional performance characteristics. 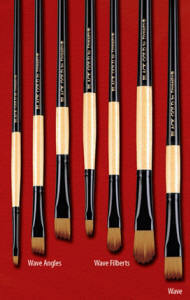 The Black Gold brush series can be immediately identified by their regal black ferrules and two-tone varnished handles. All brushes are hand-crafted, kiln dried and offer "seamless" metal ferrules to provide safe, long lasting, water resistant beauty. 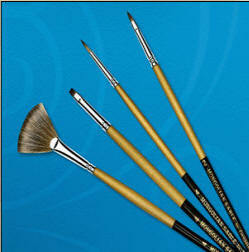 The patented Black Gold Wave Series - Wave, Wave Angles, Wave Filberts and Wave Chisel Blender brushes. The patented Black Gold Whale's Tail Series includes sizes 1/4, 1/2, 3/4 and 1. 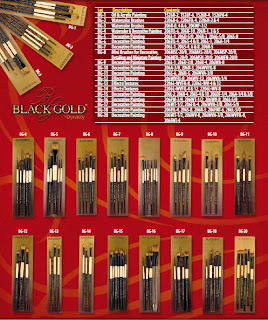 The Black Gold® Whale's Tail brush is identified by "V" shaped bristles. This is a versatile brush for painting pine and palm trees, flowers, and leaves. The Black Gold By Dynasty Butterfly Series consists of 5 brushes. 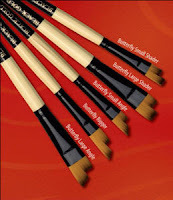 Black Gold® Butterfly® brushes create fantastic effects and delicate patterns easily. The Black Gold by Dynasty Fandango Series allows you to create multiple wispy lines in just one brush stroke. These wispy lines look so natural because they vary within each stroke. 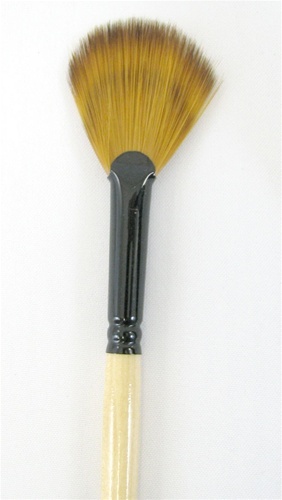 The Black Gold by Dynasty Fountain brush hairs are made with a ring fashion with an open center. The Fountain brush quickly stipples foliage; or you can use it for fur or hair. It also paints grasses and floral filler.